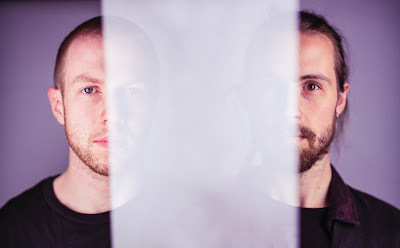 The energy Run Logan Run put into their music is palpable and the duo’s debut album, The Delicate Balance of Terror, is an engrossing blend of precise instrumentation and raw power. Martin Chilton caught up with Run Logan Run for LondonJazz News. He was also listening to a wide range of musicians, from experimental drummers such as Zach Hill and Brian Chippendale, to jazz legends such as Count Basie’s band member Sonny Payne, Max Roach and post-bop star Elvin Jones. “I was open to everything and listening to as much as possible. The internet is really helpful having so much old footage you can check out,” the 27-year-old adds. Now, through a shared passion for improvisation, spiritual jazz and heavier experimental music, Run Logan Run are forging their own path in crossover jazz. The band’s name comes from the 1976 sci-fi film Logan’s Run starring Michael York and Jenny Agutter. Johnson jokes that he didn’t get round to seeing the movie until recently but always liked Andy’s choice for the band name. The name seems apt for the album. One character in the film says, “I am more than machine. More than man. More than a fusion of the two,” and that could describe the instrumental composition The Delicate Balance of Terror. “In a way it’s about the idea of people against technology and how they influence each other and the whole world of artificial intelligence,” says Johnson. The theme and the title has an eerie relevance for the world of 2018. They work totally collaboratively, writing the music first in the practice room and then working up sections to sound the way they want, before arranging the saxophone and drum parts. They use working titles for the songs and assign the potent names (Death is Elsewhere, Post-Human and Cleansing, for example) once the songs are recorded. The album comes out on 4 May and is being promoted with a European and UK-wide tour that includes a date at London’s Under The Bridge venue in July. Johnson says they relish keeping the music “dynamic, heavy and full of noise” and then contrasting that with a subtler energy. They are rightly proud of their album and Hayes says it has come at a time when he is regaining his connection to music.